Julianne Moore stars as the title character in this remake of a Chilean film, both directed by Sebastián Lelio. Moore plays a middle-aged divorcee whose children have grown up and no longer need her. She’s stuck in a boring insurance job and goes to clubs a few times a week — maybe to date, or maybe just to dance. She meets Arthur (John Turturro) and the two start dating. It’s not a passionate romance, but Gloria wants to make it work. But when Arnold bails on her, not once, but twice — Gloria has to decide just how much she’s willing to let go of in life. 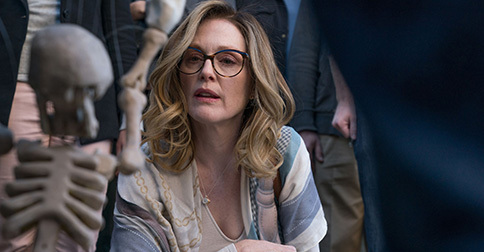 For an hour into Gloria Bell, I was puzzled as to why I was watching this poor, fairly down-trodden woman living through all the most boring moments of her life. Even after she meets Arthur, she seems to be reluctantly going through the motions. She doesn’t love cats. She isn’t terribly upset that her daughter is moving to Sweden. She’s only annoyed by the emotionally disturbed man living above her, and only feigns interest in a coworker’s sad story. She even misses her daughter’s wedding ceremony (the movie doesn’t even pause for a decision about missing it; she just shows up late). For the first hour of the movie, I wasn’t sure if I was supposed to like Gloria or not. Was Julianne Moore holding back and being passionless on purpose? The only time I believed Gloria was truly happy or passionate about something was when she was dancing at clubs or listening to music in her car. The final scene of the film makes this seem like a deliberate choice on Moore’s part, but it makes the rest of the film a bit strange until you get there. Why is Gloria so dead inside? Her children (Michael Cera and Allana Ubach) seem similarly afflicted. Cera’s character has an infant and has no idea if or when his baby mama will come home… and he doesn’t seem to care. Gloria’s mother (Holland Taylor) is also dead inside. She gets on a plane to rescue Gloria from an unfortunate incident, but there’s no chastisement or concern. There’s no dialogue at all. The only characters who have emotions or passion in the film are Gloria’s ex-husband (Brad Garrett) and Arnold. You can see very clearly that Garrett’s trying hard to be like Gloria and keep all his feelings bottled up inside. There’s one moment when a little bit of anger and self-loathing breaks out of him, and in a movie so devoid of passion, this moment really stuck out to me. I love Julianne Moore and I love the final scene in Gloria Bell. I found the finale, in and of itself, a remarkable, meaningful, and poignant moment. But it’s the ending to an anthem movie — a movie with a clear battle cry. It feels like the ending to a more accessible version of this movie. I have to say I just didn’t quite ‘get’ Gloria Bell. But I like that it has me thinking. With Rita Wilson and Jeanne Triplehorn.